I really love looking at what she's photographed from day-to-day, her photos are captivating and since I've been in her home I can tell you first hand that it's as beautiful as her photos show it to be. 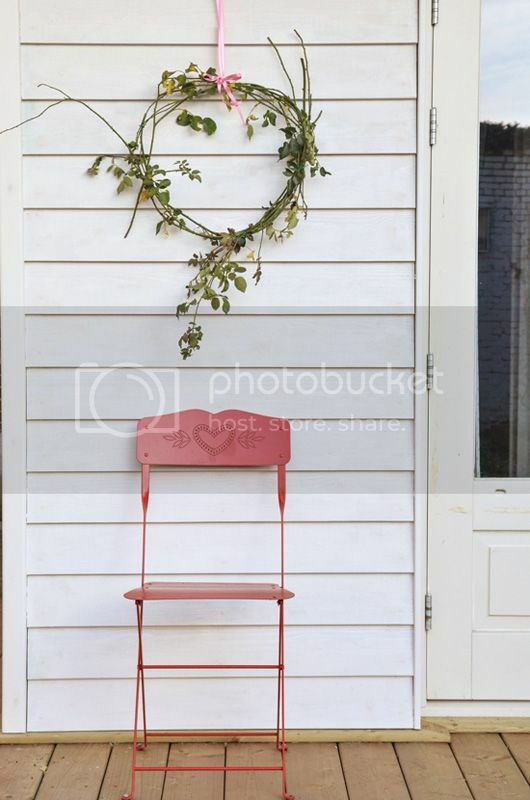 I thought that since Yvonne is really into the holidays that you may like to see corners of her home as she did a lovely job decorating it for Christmas this year. I also spent some time having a chat with her this morning and asked some questions about her approach to the holidays AND what goals she has for the new year so below find an excerpt from our tea and chat. 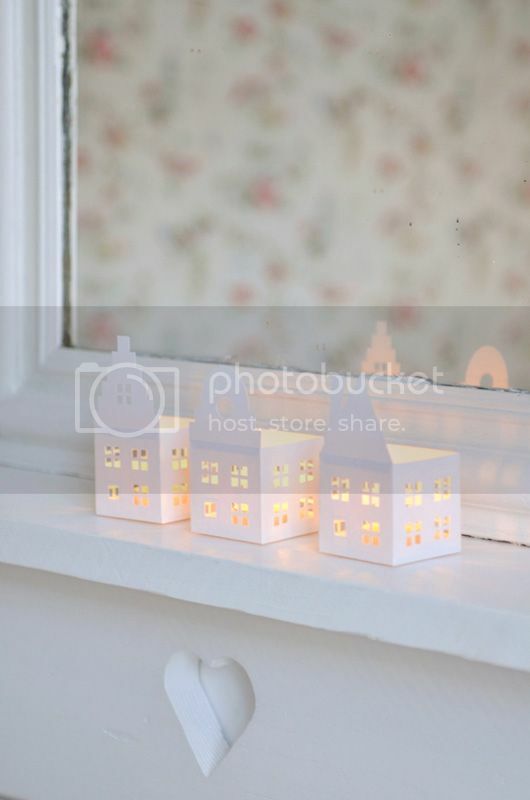 She has even included a free download so you can make the white houses shown below for your tea lights. I do hope that you enjoy it! "Download the templates and print them on 220-250 grams A4 sized paper. Cut out the templates and fold and glue where needs folding and gluing (instructions can be found on the template). Place a tea light in them and ta-da. Please be careful with paper and fire, I can not be held responsible for when your paper house burns down or your own house." - Yvonne. 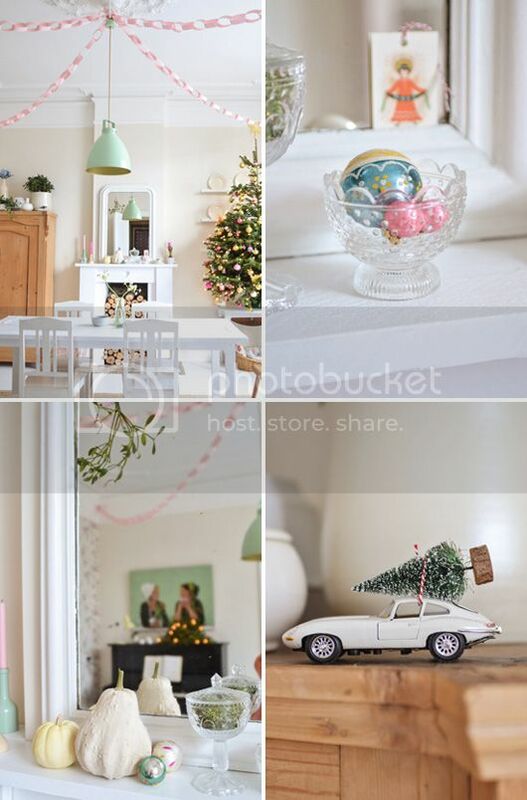 decor8: What does Christmas mean to you, Yvonne? Yvestown: That I can do all that I love all year round, like cooking, decorating and entertaining, completely over the top with glitter, twinkle lights and red nose reindeers included. 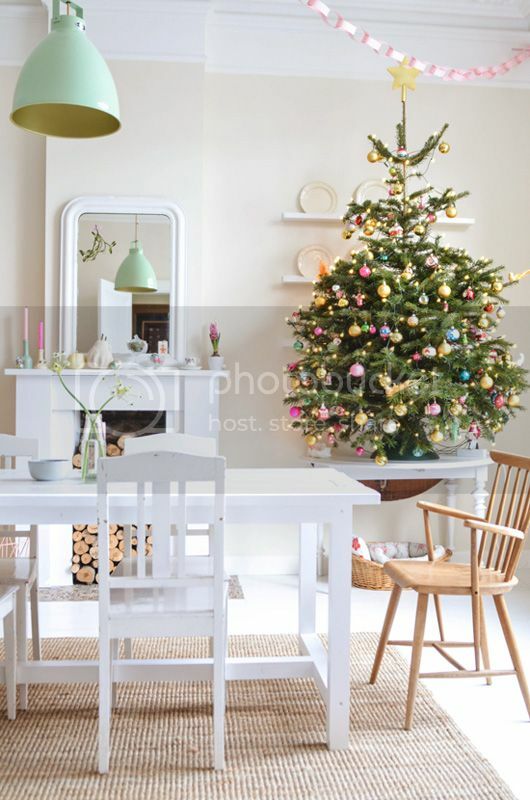 decor8: What doesn't Christmas mean to you? Yvestown: I'm an atheist so Christmas doesn't mean the celebration of the birth of Jesus Christ to me. It's an arbitrary day when all the people I love are off work and we get together to be together. decor8: What three dream items would you love to be gifted with this year? Yvonne: A Ferm Living wire basket medium in yellow, a Diptyque rose candle because they smell amazing, and the cookery book What Katie Ate: Recipes and Other Bits and Pieces. decor8: What are some special things that you do with your family and friends this time of year? Yvonne: Where I come from we celebrate Christmas on the 25th and 26th. Traditionally we go to my parents in law on the first day of Christmas and on the second we spend time with my part of the family. That varies as my sister runs a restaurant and my mother lives miles away. This year we might end up having dinner with friends instead. decor8: What will you do on Christmas? Yvonne: We eat, exchange presents and we play a massive amount of board games. 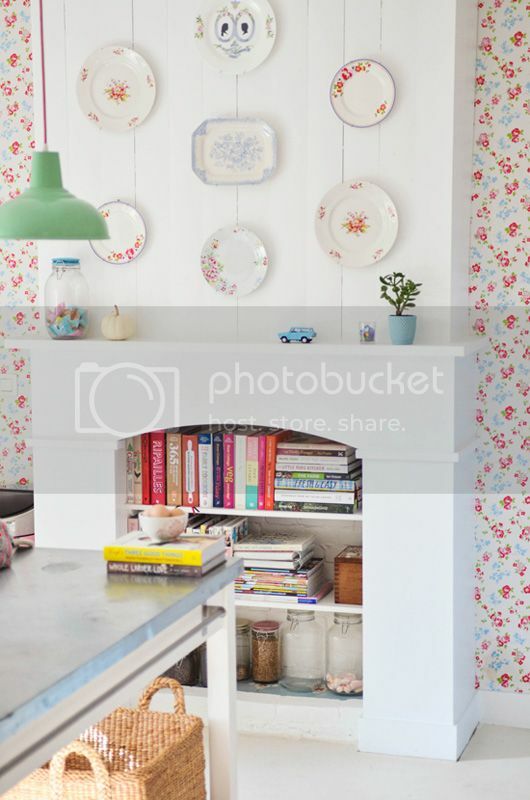 decor8: What is your favorite food to eat this time of year and why? Yvonne: It's turkey with cranberry sauce and yorkshire puddings with Christmas gravy as it's so traditional. 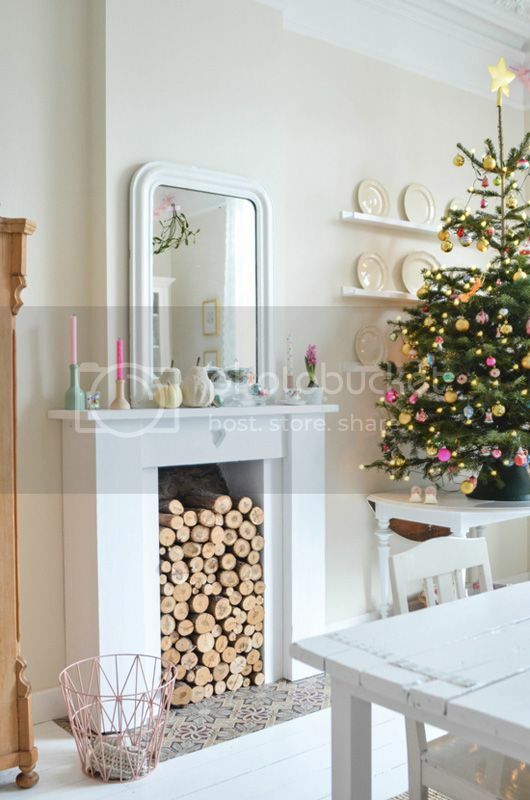 decor8: What memory do you associate with Christmas the most? Yvonne: I've inherited the Christmas gene from my mother. One year she insisted on having real candles in a real tree. My father was in agony and had a bucket of sand and water installed next to the tree. It was just so hilarious as they were arguing about something so silly as candles in a tree. They brought such a warmth to me and my siblings during Christmas and I'm so thankful for that. decor8: New Year's Resolutions! What are your goals for 2013 as a blogger and with your business? Yvonne: I want to be more serious as a blogger, not something I do as an eight hours a day side job. I want to start acknowledging that I'm now a full-time blogger and that I should take myself serious. So bloggers, what does Christmas mean to you? Would you like to answer any of the questions above and tell us?